It is always best to consult your owner's manual before attempting any changes. Most owners' manuals contain a Troubleshooting Guide. If you have additional questions SDPB has reception experts who can work with you to help resolve some issues. We're available weekdays from 9:00am to 5:00pm Central / 8:00am to 4:00pm Mountain. The telephone number is (800) 456-0766. We do not make on-site service calls. SDPB has nine main transmitters. Our main transmitters are listed below. The list includes the call letters; the city of license; the actual location of our tower site in parentheses - if different from the city of license; the "virtual" channel; and the actual digital channel on which we broadcast. A word of explanation: Although it proves to be confusing, once the digital transition took place, TV stations were directed by the FCC to continue identifying themselves by their "virtual" channel number - the channel you were used to seeing on your TV set before the 2009 Digital TV Transition. However, in some cases, we are actually broadcasting on a frequency that is different from the one you see on your TV or converter box. For example, KUSD shows up on your TV as Channel 2, but we're actually broadcasting on Channel 34. Why that matters is - in the case of KUSD and KBHE - we appear to viewers to be broadcasting on a VHF channel, when, in fact, we are broadcasting on a UHF channel. Knowing this makes a difference in the kind of antenna you use to receive our signals. VHF channels are those channels 2 through 13, and UHF channels are channels 14 and above. If you live in the KESD, KQSD, KTSD, KPSD or KZSD broadcast areas you'll want an antenna that receives VHF signals in order to receive SDPB. If you live in the KUSD, KCSD, KDSD, or KBHE broadcast areas you'll want to make sure your antenna receives a UHF signal in order to receive SDPB's TV signals. As is the case with the main transmitters, the translators use "virtual" channels to identify themselves. Viewers in the Edgemont and Pringle areas would see the translator channel number appear on their TV set as Channel 9, however the Edgemont translator transmits on Channel 15 and the Pringle translator transmits on Channel 39. Both of these are UHF signals and would require a UHF antenna. Viewers in the Pine Ridge area would see SDPB on channel 8, though the signal is actually being broadcast on Channel 10. Viewers in the Wagner area would see SDPB on channel 2, though the signal is actually being broadcast on Channel 8. Viewers of our translators in Pine Ridge and Wagner should use a VHF antenna to receive the SDPB signal. Television signals are strongest when there is a line of sight between the transmitting tower and the receiving antenna. The signal is weakened when buildings, hills, and trees block the line of sight. Signal strength also decreases as the distance from the transmitting tower is increased. Careful attention to the selection of an antenna can overcome many of the problems. When purchasing equipment keep your receipts and make sure the retailer will work with you to ensure you have the proper set-up. Two important specifications to check when selecting a TV antenna are "gain" and "directivity." Gain is measured in decibels (dB). It indicates the antenna's sensitivity. There is a greater need for gain the farther you live from one of SDPB's transmitter sites. If you live close to one of our towers, a "local" or "suburban antenna" with a gain of 5-9dB should do the job. If you live further than 30 air miles from the nearest SDPB tower, consider a "deep fringe" or "far fringe" antenna with 11-16dB of gain. Directivity indicates the antenna's ability to receive only the signals in the direction the antenna is pointing. The specification is measured in degrees - the smaller the number the greater the directivity. A highly directive antenna will have a narrow receiving angle to eliminate signal reflections that can result in interference. Alignment is critical and may take more time with a directive antenna. A movement of inches can dramatically improve your ability to receive the signal. SDPB does not make recommendations about specific brands of antennae. However, we do not recommend the antennae shaped like a pancake, made by various companies. They are often installed with home satellite dishes. These antennae are simply an expensive set of rabbit ears. They do not have the reflector and director elements necessary for quality reception. Some of the antennae contain a built-in amplifier to boost the signal, however if the signal is weak leaving the antenna, it will contain noise. The built-in amplifier will not clean up the signal; it will amplify the noise along with the signal. The appropriate solution is a larger antenna with an increased amount of gain. The other item to consider is the bi-directional nature of a "pancake" antenna. Bi-directional means the antenna is equally sensitive to signals coming from the front and back. A Bi-directional antenna is more susceptible to interference because it can't cancel a signal reflection coming from behind. Finally, because orientation (or the aim) of the antenna is so important, and because these antennae are mounted near or on satellite dishes, which are usually mounted on the south side of homes, you can't insure that they are placed to receive an optimal signal. IMPORTANT SAFETY REMINDER: Keep the antenna as far as possible from tree limbs, power lines, and any electrical equipment. Outdoor antennae are always better than indoor antennae. The mechanical details of an outdoor antenna installation depend upon the selected antenna and the available site. Shops that sell rooftop antennae offer a wide variety of hardware to secure the antenna to any structure. Consult with the shop's sales staff to select the appropriate hardware for your particular situation. We encourage you to have your antenna professionally installed if you feel uncomfortable about working on a rooftop. Here are a couple of general comments about antenna installation. The rooftop is a good location because it is a cost-effective place to obtain the necessary height. As a general rule, higher is better. Six to eight feet above the roofline is usually adequate. If the house is located near a heavily traveled highway, the antenna should be placed on the far side of the house away from the highway. The antenna and its mast should be well grounded. Fully extend all elements of the antenna. The antenna should be positioned with the horizontal elements at right angles to the SDPB tower. Refer to the section on Antenna alignment for further information. Connect the antenna to a television to check reception. If it is unsatisfactory, the antenna will have to be moved or rotated until a strong, reflection-free signal is received. Once the antenna is aligned, it should be locked down tight to prevent it from moving in the wind. It is wise to check your antenna periodically to make sure that it remains solidly-mounted, that the connections are tight, and that the wiring hasn't frayed or decayed. The next best option is to place a full size antenna in the attic. This approach has many limitations. The physical space may not permit optimum orientation. Structural elements of the house can block and reflect the signal. Attic antennae may not provide enough height to clearly receive the signal. If you are installing an antenna in your attic, locate the antenna in a place where all of the elements can be fully extended. If there is enough room, experiment with different places in the attic. Sometimes the movement of only a couple of feet can make a world of difference with the quality of reception. It does not mean that your house is located in an area outside of SDPB's signal range if an attic antenna does not result in satisfactory reception. More than likely, it means that you will need to move the antenna to an outside location. The least expensive antennae are the indoor, set-top variety. Often times they are provided with the television set. Older sets have separate connections for the UHF and VHF antenna. If you are using a loop or bow tie with an older set, make certain the antenna is connected to the UHF terminals with the screws tight and secure. For best results, locate the indoor antenna near a window, away from electrical sources. You will need to experiment to find the best orientation and placement. It can take a considerable amount of manipulation to optimize for best reception, and after moving your antenna you will have to perform a channel scan. The movement of people in the room can affect the signal, so it is best to place your antenna on a solid surface. If your television set was not provided with an indoor antenna, there are generally four types available for purchase - the Loop, Bow Tie, Rabbit Ears and Combination antenna. The UHF loop antenna only costs a couple of dollars. It is quite literally a round wire loop. On older television sets, the loop connects directly to the UHF terminals on the back of the set. Make certain that the UHF screws are securely tightened. Bow Tie antennae are slightly more expensive than a loop antenna. The bow tie is often times clipped to the telescoping pole on a set of rabbit ears. Rabbit ears consist of two telescoping poles that stand up like a "V". Some UHF-VHF rabbit ears have a round loop sitting near the base of the "V". UHF is received with the loop. Rabbit ears without the UHF loop usually provide disappointing UHF reception. The Combination Antenna is a set of Rabbit Ears combined with a UHF Loop antenna built into a single, stand-alone unit. There are so many different types of televisions in use we can not provide specific instructions for each model. Please refer to the owner's manual of your TV set or consult a local dealer for your type of television. Here are a few general notes to help point you in the right direction. Analog TV sets are those manufactured before 2007, when the inclusion of digital tuners was mandated by the FCC. These TV sets will require the use of a digital converter box in order to receive a signal. If your TV set is analog, you may purchase and install a converter box, available at electronics retailers and department stores. The coupon program that the federal government operated in 2008-2009 has ended. Applications for new coupons haven't been accepted since the program ended on July 31, 2009. Coupons expired 90 days after issue. Television sets larger than 13" manufactured after March, 2007 were required to have digital tuners built into the TV set. Check your owner's manual to make sure your set has a digital tuner. If your TV has a digital tuner, you do not need a digital converter box. A Digital TV will allow you to see digital TV signals, but do not necessarily provide you with a High Definition picture. To receive High Definition, your need a High Definition TV (HDTV) set. Standard Definition TV sets are an affordable option to higher-priced HDTV's. All High Definition TV sets are digital, and therefore do not need a converter box to receive signals. HDTV's provide superior picture and sound of programs that are broadcast in High Definition. 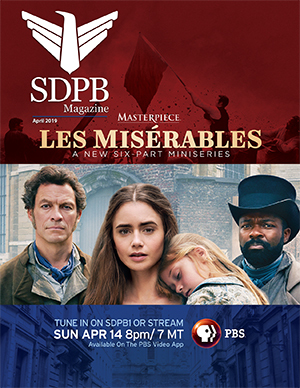 SDPB TV's main channel, SDPB 1, is broadcast in High Definition (HD), although not all programming on that channel is in High Definition. The programming on SDPB 2 and SDPB 3 is not broadcast in High Definition. If you subscribe to satellite TV, it is best to check with your satellite service provider for details about receiving local channels through their system. The two companies that provide this service are DirecTv and Dish Network. In some cases local channels are available, sometimes at additional cost, and in some cases extra equipment is required. In other cases local channels are not available through your satellite provider. In this situation you will need to attempt to receive SDPB and other local stations via antenna. You should refer to your satellite company or owner's manual to determine how an antenna interfaces with the satellite equipment. An important element often overlooked is the transmission line. It is the wire that carries the signal between the antenna and the television set. Transmission lines deteriorate with age. If your transmission line is worn-out, you may not be able to receive a signal, even if the antenna and television are brand new. For optimum performance, a transmission line should be replaced every five years. That does not mean that you should change a five-year-old line if you are satisfied with the existing reception quality. Just be aware that the condition of your transmission line has a major effect on any over-the-air reception. If you are installing new transmission line, it is important to select a quality grade to minimize signal loss. Round coaxial cable and flat twin lead are the two basic types of transmission line. Twin lead cable is less expensive, but it deteriorates faster and is more susceptible to interference. The RG-6 coaxial cable is highly recommended. You should switch to the coaxial cable if you are having reception problems with the twin lead transmission line. Here are a few tips about transmission line installation. Use the most direct route possible between the antenna and the television set. Long cable runs result in signal loss - the shorter the cable, the better the picture. The line should be kept as far as possible from electrical equipment, even if it means a longer cable run. One continuous piece of cable is best. Keep the line free of splices and sharp bends. A pre-amplifier mounted near the antenna can boost a weak signal. Signal strength deteriorates as it travels down the transmission line to the TV. A weak signal will be non-existent when it reaches the television unless it receives amplification before the trip. The pre-amp boosts the signal to offset any loss from the transmission line. An amplifier (as opposed to a pre-amplifier) only prevents additional signal deterioration. If the signal is noisy leaving the antenna, the amplifier will amplify the noise along with the signal. Amplifiers are used to boost a signal being pushed through a long wire run, or being sent to multiple TV sets. Households with multiple sets often use passive splitters to send the antenna lead to different televisions. Passive splitters do not require any power to split a signal two to four times. If your equipment is properly connected, but you aren't getting a signal, it might be that the signal is being split among too many sets. If you are using a splitter, bypass it by directly connecting the antenna to a television set. If you are then able to get a signal, you will need to get an amplified splitter to send it to multiple TV sets. The amplified splitter divides the signal and amplifies each output. If you live close to one of our transmitter sites and receive distorted pictures from SDPB, the incoming signal is possibly too strong. The problem is easily solved with an attenuator. It is a passive device that simply reduces the strength of the incoming signal without losing clarity. The device can be found at the same place that you bought your antenna. Our first piece of advice always is to start by performing a channel scan, or "re-scan" your TV set or converter box. If that doesn't solve the problem, check to make sure that our signal is actually being transmitted - SDPB occasionally performs maintenance on a transmitter site, or loses power or has other technical issues that prevent a signal from being broadcast. You can call us, check with a neighbor, or check the "spotlight" scroll at the top of our home page to see if we are experiencing technical issues. If performing a channel scan on your set hasn't resolved the issue, and you're sure SDPB is broadcasting a signal in your area, follow the next steps to troubleshoot. We suggest that you have the User Manual for your TV set handy, and that you're using the correct remote control. If it has been a while (6 months or more) since you changed the batteries in your remote, you might start by changing the batteriesâ€¦that might not solve your reception problem, but it will make other procedures less frustrating. Next, if you have an indoor antenna, it's possible that the antenna was moved. Try re-orienting the antenna (you'll have to perform a channel scan, too) for optimal signal. Your antenna should set on a solid surface (if it isn't attached to the TV set) and should be as securely mounted as possible to prevent it from being moved accidentally. Start at the television set and work your way toward the antenna. First, make sure that your TV is receiving its signal from the correct source. Go to the menu on your TV and look for the "Input" function, often labeled ANT - CATV or TV - CABLE. It should be set to ANT or TV. Next, check for a loose antenna connection on the back of the TV. If everything is secure and tight, examine the condition of the line. Transmission lines can suffer damage from hungry pets and vacuum cleaners. A nicked section of line should be repaired or replaced. If everything looks fine behind the TV, grab a ladder and head outside. IMPORTANT SAFETY REMINDER: Be aware of power lines and tree limbs. If you are not confident climbing onto the roof of your home, please hire a professional to assist. Loose connections and damaged antenna elements will be readily obvious by a visual inspection. Make certain that all connections and fasteners are tight and secure. Look for frayed wires, corrosion, or other evidence of deterioration. Check the orientation of the antenna. Windstorms can blow the antenna out of proper alignment. Breaks or short circuits in a transmission line will cause a reduction of signal strength. Lines that are loose from their fastenings may swing against other objects causing frequent loss of signal. Secure the transmission line and repair any chaffing. Replace the transmission line if it is in bad shape. Wind, hail, and ice are the most common cause of damaged antenna elements. In most cases, it is better to replace the antenna if there are several broken elements. Even if the elements can be reconnected, the performance will never be as good. Clean any corrosion found on the antenna connectors. The corrosion on the terminals can be removed with steel wool or an emery cloth. Your antenna system is just like other equipmentâ€¦it requires maintenance. The entire outdoor antenna system should be visually inspected at least once a yearâ€¦maybe when you are cleaning your gutters each year. Remember - safety first! Avoid power lines and wear appropriate clothing. If you have additional questions please call SDPB weekdays from 9:00am to 5:00pm Central / 8:00am to 4:00pm Mountain. The telephone number is (800) 456-0766. If you are having interference problems, consult this excellent resource offered by the FCC.